Thursday does have better impression than weekends! So we are going to stick with this for the time being. 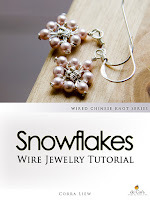 So here's this week's Thursday Special: 50% OFF Snowflakes Earrings Tutorial, available for download at de Cor’s Handmades official website – please take advantage of the 20% discount for second item too if you are intended to get more than just this tutorial.